"Last Tableau". The first sneak peek of next week's final episode of Season 6, 6.12 "This Is the Way the World Ends". Click the link below to watch it! Sneak Peek #1 Last Tableau. Miami Metro tries to figure out the rest of Travis Marshall's plan. Im not watching any of these this week.... I cant freackin wait for Sunday. I hope Jamie does not die. 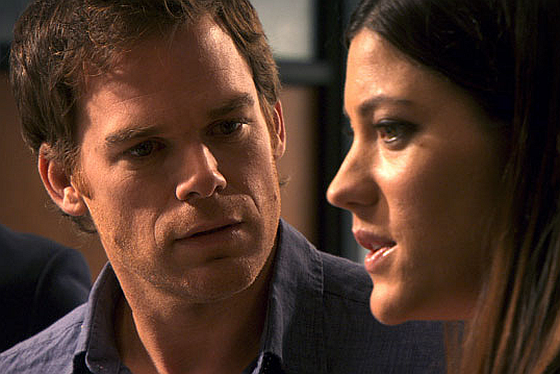 I love to see that deb is so uncomfortable around Dex. lol...I know. Isn't it funny? Oh yea, she nails it. Great acting! That feeling you have when you are really in love with someone and them just being near you makes you feel like your own skin doesn't fit! You are thinking "Do they notice? Do they know?" You want to tell them, but the fear of rejection makes you sick to your stomach. You are right, now way they have the balls to go through with it. Too many whiners, and too much pressure from critics who expect shows to conform to 'their way'. It's like the popular crowd from school run amok on society. That's why is so tough to make great art for the masses anymore, there is no freedom for writers and producers to deliver the goods. I've watched Dexter since it started and I must say I love every single episode, especially the one where Dexter finds Gellar in the freezing box and figures out Marshall is the man behind it. I can't wait to see the finale episode tomorrow!! !